He had a funny name. It was even stranger to have learned that he had changed his name from something even funnier sounding, Cassius Clay. He had converted to Islam, which back in the early 70’s meant he was an enemy of Jews like me. At least that’s what I was taught in Hebrew School. Jews and Muslims did not get along. In the Middle East they killed each other. All the time. He was called a draft dodger. Even though I grew up in a fairly liberal family, the town I grew up in was relatively conservative for the times. Being a draft dodger made Ali a bad American. That’s what my friends parents said. Even some of my school teachers said it. Heck, even Jackie Robinson spoke out against Ali’s refusal to go into the Army. That meant I had to root for Joe Frazier. So I did. And even though I had long since gone to bed before their first fight started, my Dad told me first thing the next morning that Joltin’ Joe had beaten Ali in a 15-round decision. All was right in my corner of America. So how did I learn to become a fan of the fighter who referred to himself as the “Greatest of All Time?” Most importantly, I grew up. And in growing up and watching Ali I learned from a black man that everything is not black and white. Put his abilities in the ring aside. As good as Frazier was, Ali was the best athlete I ever saw. If you saw him around his prime no explanation is needed. I use the word “around” when describing Ali’s prime because he was banned from boxing when he would have been at his peak. He wasn’t banished from the sport for dirty antics in the ring. Or for underhanded business dealings. It was because he spoke out for those who didn’t have a platform to speak for themselves. He made America uncomfortable by holding up a mirror forcing those in the majority and in power to take a look at themselves. It was ugly. And the powerful made Ali pay a price for loudly pointing out their failings in a braggadocios style that clearly indicated the boxer didn’t know his ‘place’. Much of this happened before he fought Frazier and before he was banned (and then during his banishment). And before I was old enough to understand what this fighter truly fought for. Colin Cowherd often surmises that liberals are who they are because they were picked on or even bullied as kids. Perhaps they were smaller and not as physically imposing. Thus they identify with those who are powerless, voiceless, oppressed. Sure, that could be described as ‘dime store psychology’. But I believe through my own experience there is some truth to the premise. But it doesn’t explain Ali. He was the biggest, fastest, strongest guy. He was the guy who easily could have been the bully. The guy who made his living in the most violent of professions other than soldier. But he came from a place where his physical might couldn’t drag his people out of a world of Jim Crow, voter disenfranchisement and systemic poverty. So, instead of being the bully, he preached social justice. And peace. And the world loved him for it. And eventually so did I. A Jewish kid who at age 10 didn’t understand Ali became an adult who did. Thanks, Champ. Thanks for reminding us that someone who made Islam his chosen faith, who would not serve in a war he viewed as unjust, who encouraged the downtrodden to stand up for their God given rights, who walked the walk every religious holy text encourages us to: by treating others the way you wish to be treated. And by fighting for justice. There is a difference between a boxer and a fighter. 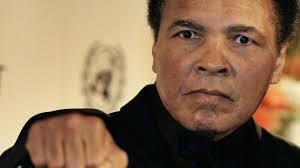 Muhammed Ali was a fighter. RIP.